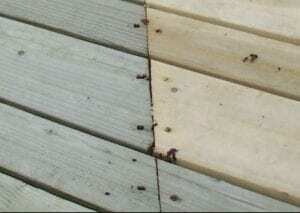 To better blend new and old deck boards, it is necessary to wash the entire deck. Use a good wood cleaner and a pressure washer to remove any dirt, mold, mildew, and graying from the older deck boards. The newer deck boards will normally have mill glaze on them which can prevent good stain penetration. Use the same method to clean all the new boards as well to remove any mill glaze. Cleaning the entire deck in this manner will also help the new coat of deck stain perform better. A clean wood surface prepped correctly will ensure better performance, coverage, and lasting protection. After cleaning the wood, apply a wood brightener to the deck. A wood brightener will lighten all the older darker boards and open the wood pores of the newer deck boards for better stain penetration. This step can help a lot when trying to blend new and old deck boards. 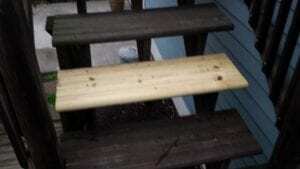 It can also help to sand the boards once the deck is clean and dry. Sanding the old wood boards will remove additional soft wood fibers to create a harder surface. Sanding newer already dense boards will have the opposite effect and soften the wood fibers up a little and remove any mill glaze that cleaning did not. In addition to these steps for blending new and old deck boards, using a quality semi-transparent deck stain will help. Follow these prepping and staining tips and your newly repaired deck will not only be safer, but it will also definitely look better as well. Pictures for my comment below. The boards at the top and bottom of the picture are the new boards that I stained, the board at top of pic I sanded with 150 grit to see if that would help…it didn’t. The other picture is the “before.” Thanks! You will not be able to get the new wood to match the older wood in this scenario. Nothing you do will make it blend when using a transparent stain. The brand new wood is just not absorbent enough to accept the stain the same way as the older wood. Thank you so sand off or leave it alone? Hi, novice here. I have a pressure treated deck and hired someone to stain. They replaced 2 boards and I am trying to get a stain that somewhat matches because the mismatch is driving me crazy. I have a semi transparent cedar stain down, they also put on new boards which turned yellow. I tried different stains to get to match, and it seemed I needed to go really dark, so I applied Moorish teak opaque oil based. Looked okay until it dried. I sanded one of the boards with 150 grit, only made it worse. Some dried a bit shiny which makes me think it didn’t absorb. Glad I found your site! 1) should I try to brush paint thinner on these boards to decrease the darkness? 2) should I try to sand off with belt sander and apply another stain? 3) Should I sand some off and put another stain down? Thanks in advance for your help. I will post pictures in another post because I don’t think my previous post worked with pictures. Thanks!! When blending new and old deck boards together do you still have to wait months to stain the new boards? It seems kind of crazy to stain all the older boards and railings and not the new boards? Please help! Our handyman who is going to be doing the job is not quite sure himself which way to proceed? If you stain the new boards without weathering, you will most likely have to apply another coat to those boards on 6-12 months. I have a deck that was improperly painted with an opaque stain (probably Behr) by the previous homeowner the year I got my house. It started flaking off within a few months. Fast forward several years and it’s time to do it right!! I’ve taken off all the flaking stain that I could so it would dry and will sand off the rest with a drum sander and edger. There will be some wood that will need to be replaced. I’m interested in using Restore-A-Deck Wood Stain. Do I need to use a cleaner and brightener before I stain or is the complete sanding sufficient? Thank you for this website; as a first timer, the information here and the accessibility of its presentation has been very helpful. Do not sand with a grit finer than 80. Clean and brighten for the prep after. This will help the new stain to soak in deeper. You may only want to apply 1 coat of the RAD stain this time around. Another light coat to the floors in 12-24 months. 1) Do I need to let the sanded wood weather before I do the clean, brighten, and stain? Or can I do it as soon as weather permits? It seems I read both options as viable. And that said, do I need to time it so all 3 tasks get done within a few days of each other? (I don’t know the waiting time or the effort involved in the clean and brighten steps). 2) Same for the new wood: one commentary said to let it weather, then do the clean, brighten, and stain. Another said to sand it along with the rest of the deck and go ahead and prep and stain it along with everything else. 3) once all is done, would it be wisest to NOT put down an outside rug? I read about rug outlines. 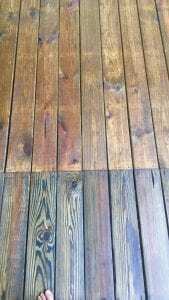 I never had that with the opaque stain, but am wondering if it would interfere with the natural weathering that I’m guessing will take place, especially the first year after applying the Restore-A-Deck Wood Stain. Thank you again for your help. It is a life-saver and great anxiety reducer!!! 1. Either. Weathering after fine grit sanding is suggested. If not weathering, do it all within a week or so. 3. Rugs will cause inconsistent fading when using a semi-transparent. Not really an issue if the rug is always in the same place. ‘weathering after fine grit sanding is suggested.’ I thought one did not use fine grit when sanding because it made the wood pores less penetratable, but did all the sanding with the 60 to 80 coarse grit sandpaper. Correct but not all follow the sanding directions and sand too fine. If you sand with no more than 60-80 than you should be okay. Your new wood is an issue though and that needs to weather. Can you hear me yell “Arghhh!”? It became clear after 3 hours of sanding with a drum sander that it would take several days to get the crappy (Behr) solid stain removed, if I was lucky. Plus after reading other comments about using pressure washing, stain removing products, and sanding and still not getting it all off, I realized the time and money would be better spent on new pressure treated wood. An improvement since the current deck was rotting on a number of boards and likely not PT. I even briefly contemplated composite decking (there is some the same price as PT wood) until I read the really bad reviews. I suppose I could have painted over all the blotches with a better solid stain, but I feel really untrusting of opaque stains and am wanting just wood and a semi-transparent stain. So soon I will have a new deck of PT fir/hemlock in WA state with some hot afternoon sun for our brief summer, and lots of wet for the rest of the year. Current deck gets some algal growth. Not too much traffic, but lots of pots (on wheeled plant caddies). I was aiming for RAD. I like everything you say about it and am drawn to the eco formula. But I’m wondering if an oil based stain would be better? Or if it doesn’t really matter which I use. Thanks. And yes, I will let it weather for the appropriate period of time before prepping and staining. RAD would work well. If you want oil based, try Armstrong Clark. I’m still here! Just purchased the PT douglas fir decking at my local lumber store and they were adamant that it did not need to be stained; that the pressure treatment chemicals are filling any available pore space already. And yet on your website I’ve read repeatedly about staining PT wood. Mostly pine–don’t know if that makes a difference. I am also thinking that if I don’t stain now, in a few years of weathering, staining might be needed, as well as possible. What are your thoughts on this? Prep all with a deck cleaner and then a wood brightener. Stain with a semi-solid color so it blends better. Try the Armstrong Clark Wood Stain. Great read. Thanks for putting this post together. Question in redwood decking. I am in a new build home (Colorado, so sun and snow through the winter) withmall redwood deck. Been here 6 months, haven’t stained or treated the deck. I’d like to extend the deck but am trying to set my expectations for how that will look. With no staining or seal on the original deck it’s now greyish after 6 months. If I add new redwood decking to extend it, should I let it get a similar weathered look through the winter and then in the Spring power wash and seal or stain? Should I do something to the current deck to stop the weathering so that the new addition can catch up? What’s my best bet for matching those colors and then protecting a redwood deck (I like the natural color so I wasn’t planning on any colored stain)? Your posting and responses are very helpful! We have an old deck (~20 yrs old). We prepped it by power washing and sanding and deck cleaner. We are now staining with a semitransparent oil stain, using a pad. My question is, do we need to stain between the boards? Of course, a little bit has dripped down, but not sure if this is something we need to stain directly, I assume by taking a pad a running it along each edge. You do not have to stain between the boards but many do if you have wide gaps. Only for appearance. Thank you so much for your response! I think we will end up doing so, only because the gaps are wide enough that you can otherwise see the drips. But based on your input, we will keep it to a very light coat! I have replaced rotten boards on Deck. I have stripped and cleaned old stain. I want to put a water sealer on next. Can I do it now or do I need to wait 30 days and let the new boards dry out so they’ll be the same color. I’m afraid to let the old boards set too long without a water sealer. Everything has been power washed and restained. New replacement boards stick out like a sore thumb. Is there anything we can do besides just adding extra stain to new boards? Too late to start from scratch. Adding more stain will not darken these boards to blend and will not soak into the wood. Just leave alone. They will blend next year when you redo. Just had my deck restrained and the outline from the outdoor rug is still visible. Sorry but no. You could put the rug back in the exact same spot so it does not show. Sand off the old solid stain and brigthen the wood after. Clean and brighten all wood that is unstained. Use the Armstrong Clark in a semi-solid for all. 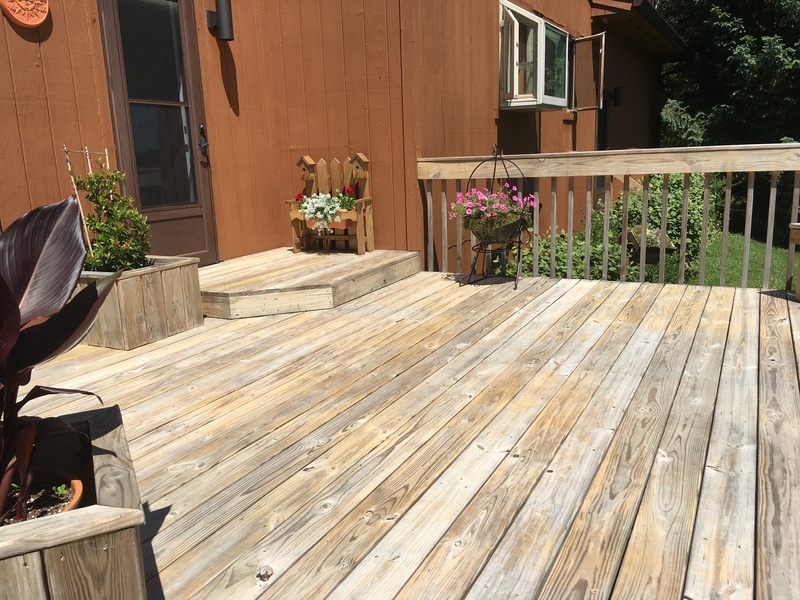 Can I successfully apply semi transparent or semi solid stain on this newly cleaned two year old deck? I prefer textured luck. My goal is to preserve wood from Midwest temperatures (uv rays and cold temps). Yes, you can use a semi-solid or semi-transparent now. We have old cedar deck. Stained every two years. We have totally sanded and ready to stain. Our boards are many different colors due to replacement. Plan to use semi-transparent stain. Do we need to use brightner 9brand?) and how long after using it do we stain? Thank you. Clean and brighten for the final prep. Wait 48 hours to stain after the prep. 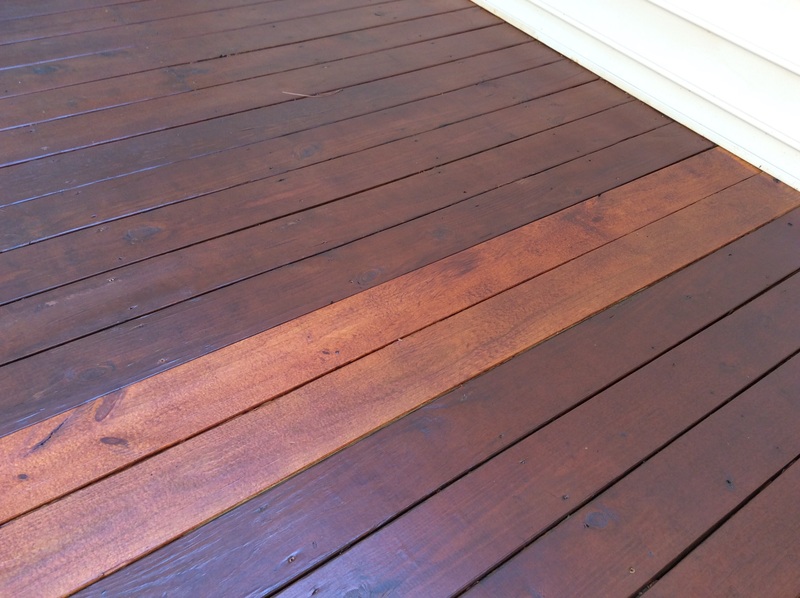 Can I use Yenkin Majestic Paint Stain on my deck over Cabots after pressure washing? Both are cedar in color. Sorry but do not know. Never used or heard of that brand. It is a penetrating stain so it does not peel when properly prepped and applied. Spent the time and effort to properly prep deck for oil stain. Finished applying stain and wouldn’t you know it, rain, about 12 hours after I finished. That was a week ago. Can I simply reapply stain to the entire deck now that the weather is clear for several days? Please tell me I don’t have to prep all over again. Depends on the brand of deck stain you used but you may need to remove all and start over. Depends on the brand and type you used? Not all are the same and how to fix varies. If waiting is preferable, should I also wait to strip, clean and brighten until closer to staining time or go ahead and do that now? Wait until Spring. Clean and brighten the wood then. Thank you. My other question I forgot to mention was the back deck has some semi transparent that needs to come up. Does stripping take the place of cleaning, or will I need to strip, clean, then brighten? Sorry if this has already been addressed elsewhere. No need to use a cleaner is using a stain stripper. Brighten after. We have spent weeks and lots of money getting solid stain off the deck. Finally done. We added an addition 5 years ago to a 10 year old deck after solid stain removed the newer side is still very much lighter. We have stained it thinking we could just add mote stain to newer side to make it darker. This has only made it redder than the other side we used dark walnut transparent stain. I don’t want to go through the stripping process again! Are there anyway to blend this with out solid stain or redoing? No way to blend this with a semi-transparent stain at this point. Natural weathering and a recoat in a year or so and should blend then. I have this situation (different aged wood) is semi transparent the best option? Semi-solids will blend better. Try Armstrong Clark in one of their semi-solid colors. what if i mix new boards and old boards , wash it, then solid color stain it? would that work better? Thanks. Solid color stains will blend better but they can be prone to peeling. I wish I had found this great site LAST weekend! I have a redwood deck of unknown age previously stained with a very dark purplish opaque stain. I pressure washed. The stain stayed in the few shady areas and in knots of the wood. I took out my belt sander to fix those areas (35 grit). The deck looks gorgeous. But after reading this site – oops! – What should I do now before staining? Or just PW, Brighten, stain? Second, when do you know to replace the boards? I have 6 with minor surface cracks that go down about 1/4″. All are still as solid as their neighbors. And if I should replace, should I age the whole deck? THANKS for the help! The boards sound like they do not need replacing. As for the stain, the only way to effectively remove a solid opaque stain is to sand it all off. Just installed this new step and it’s raining for about a week before I installed. Should I wait until everything dries up to try to match the older boards or does it not matter? Also should I pressure wash everything then try to stain the older boards too? Thanks! Have a treated deck, already stripped and used brightener… But looks like I should have replaced the rotted boards first oops…I was thinking of sanding the old boards to see if they would lighten up more(I prefer transparent stain and the color dif between new and old is still significant) so would I have to re brighten the deck? Sanding will not lighten up the boards much or at all. You will have a slight difference between the new boards and the old boards no matter what the first time staining until the new boards become more absorbent. I have an older deck that will need about 20% replacement of the deck boards. Is there a way to tell if they were PT or Cedar 2 X 6 boards? If PT, how to prep and stain to match old wood? If pressure treated, it will most likely have a \”greenish\” hue on the inside if cut. Cedar has a light orange/red color and the smell is more aromatic if cut. Three new boards added to replace rotten ones. Deck has already had every thing done to it before new boards were added. Now a problem. What to do to the three boards to blend them in to old deck that will be acceptable. No thought was put into this issue when the decision to replace the boards due to safety issues. Try to blend with a semi-solid color. Use Armstrong Clark stains. Prep well first. 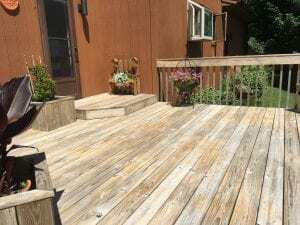 Since I just found this article today, I was wondering if I need to go back and do the deck cleaner when I used a pressure washer and sanding the old boards.I did nothing to the new boards yet. Can I just sand them like the rest of the deck and then do the brightener or go back and follow your suggestions? It's been a lot of work sanding if I can get the same effect as the cleaner and then move on to the brightener–would be great news! Thanks! Since you already started to sand it would be best to sand all so you will have an even appearance when staining. Do apply the brightener after the sanding. Rinse well with water. Could you reckoned a deck brightener brand for me? Thanks for all the help too. I have a cypress ceiing in my den that we put up 31 years ago. The ceiling also had box built cypress beams, which we recently removed. We whitewashed the ceiling and it is beautiful except for where the beams were. That area won't blend with the rest of the ceiling no matter what we do. Also, there is a dark line that seems to outline where the beams were. It is a slight line but we can't get rid of it. We have tried sanding, that made the differences show up more. We tried stripper, denatured alcohol, etc and nothing we do blends the two. Any help would be greatly appreciated. We are trying to find a solution other than having to spend a fortune to put new beams back up to cover the discolored wood. You will not be able to remove this discoloration or get it all to blend. I am staining my deck with 1501 cedartone. Some boards are a nice golden color and some are dull greyish after the application. The deck was powerwashed three weeks ago. Why do you think there is such a noticeable difference. The wood itself is the issue, not the stain. 1. what grit should I use for the final sanding? 2. do I still need to use the restore a deck products since I have removed the previous stain on the old boards? 3. my preference is to use a brush, do you have any other suggestions? 2. Yes that would help the stain to absorb better. 3. Brush or stain pads for exterior wood. I am trying to restore a 20 year old cedar deck (2×4). I have used a stripper and a power washer (turned down to about 1500 PSI) to remove the layers of old staing, mildew and crud. I'm having to also replace some of the boards due to rot. I have found some weathered old cedar boards at a used building supply store. The boards look very porous and grainy so I'm thinking of renting a drum floor sander to smooth out the deck. Should I still use a cleaner before I stain after I sand? BTW, I'm going to apply TWP 100 natural cedar semi transparent. After the sand it would be best to use the cleaner. Thanks, I thought so. Someone told me the cleaner would prepare the wood to receive the stain better. I going to use Behr Premium Wood Cleaner. Is that okay? what is the best way to get semi-transparent stain off the vertical spindles (my are 1 inch square by 3 feet)? Deck stripper and pressure wash off. Use the Restore A Deck Stripper or HD80 Stain stripper. Brighten the wood when done. i have an old redwood fence that I'm attaching a new redwood trellis/posts. I was advised to use a semi transparent stain and I am planning on using the Arborwood brand but don't know what stain is going to match them both. I want something along the cedar or natural color. Do I need to buy two different colors of stain or will one work? I am getting it pressure washed and could put a brightener to it if necessary. any suggestions? Clean and or strip to make sure all wood is clean and free of any old coatings. Brighten the wood when done. It will not be exactly the same but hopefully close. What grade of sandpaper would you use to sand old and new wood? Question – Blending old and new deckboards. Undecided on final product. Completed cleaning of deck floor and stripping of old, oil-based stain that was mostly on the spindles. Next up: first sanding, then a brightening product. Haven't used a power sander before, but can rent one pretty cheap. Can an amateur power sander handle a heavy-duty sander without making a grievous, irreversible mistake? My deck nails/screws are countersunk fairly well, so I think I can go across them with no issues — at least, lightly. But how skilled to do you have to be to sand the entire floor evenly with no bad cuts? You should be okay with a power sander. Just do not gauge the wood by trying to hard in certain areas. Mixing new red cedar with old redwood. Should I sand before/after brightening and what grit sandpaper do you recommend for the new cedar and old redwood? Sand first and brighten after. Rinse wood well with water. 80 or 60 grit paper. Would it make sense to sand the New wood with a rougher grit (e.g. 60) to soften the fibers and the Old wood with a smoother grit (80) to harden the fibers? I was thinking this would help equalize the absorption since the old wood absorbs like a sponge and it lays on top of the new wood after sanding both samples with 100 grit. Also, the new wood was laid 2 weeks ago and I cleaned/brightened 1 week ago. Should I wait and let the wood age before I sand and re-brighten or should I just sand and stain it now? I have a 6 year old deck, this will be my 3rd time staining, there are sections of the deck that the stain has peeled off. In the past I used a transparent stain, this time I believe the better road is to use solid stain. My question is after I power wash the deck what prep work do I need to complete to get one solid smooth colour on the whole deck. Also can you recommend a solid stain brand that will last more then one year. Not sure what you mean about complete. Look at Flood solid color decking stains. Oil based stains will perform better. Our deck has new and old wood so we used an solid stain. It started peeling so we have scraped, cleaned, and it has dried but we can't decide what product to use next. Any suggestions. We've ready many reviews of products but don't feel there are many good options. Has anyone used Duckback Superdeck Elastomeric Paint? Did it work? Can't find any reviews on it. I'm in the same exact predicament. What did you decide? I was thinking about duckback also. no offense, but this article doesn't address the issue suggested by the title, namely how to blend new and old deck boards. Doing what was put forth in the article will not blend them, generally speaking. If you really want a blend, then after doing what was suggested in the article, you are going to have to experiment with stains on the new boards primarily and then a protective coating over all of it. We have a deck that we stained a couple years ago and an addition to the deck from earlier this year. We want to restain the older part and stain the new part to match. Should we strip the old stain first, then use an oxygen cleaner and brighten everything? We started by using a bleach-based deck cleaner on the old part, which I see now was a big mistake. It left splotchy areas of bleached wood/old stain and made the wood fuzzy. How do we get back on the right track? Thanks! Megan, strip than brighten the wood. Lightly sand if you have furring after it dries. This will restore the wood before the staining. did not do any of the above. some slats and tops on posts are new. already stained. big mess is there hope? Nell, probably need to strip and start over. Might want to wait until next Spring as it will be easier to remove.